Roasted Acorn Squash Slices, Thyme for Cooking fall vegetable. Roasting winter squashes concentrates their natural sweetness and all you need to finish is a bit of salt and pepper.... or you can smear on butter. Cut squash in half, through stem and blossom ends, and scoop out seeds. Then cut in 1" (2.5cm) slices the short way. Mix rosemary and olive oil. Toss squash slices in oil. 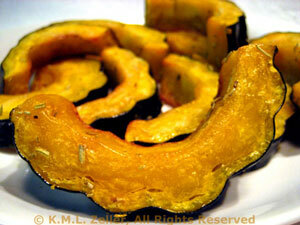 Lay squash on a baking sheet and bake at 400F (200C) for 25 minutes. Turn slices and bake another 8 - 10 minutes, until fork tender.